This feature was submitted by Bruno Grinwis of BBG-BBGM to showcase their new office interior space — and the thinking behind its design — within the Empire State Building in Manhattan. Designed by the Washington office’s Workplace Interior Team, BBG-BBGM’s new 32,000 SF office is located on the 25th floor of the Empire State Building and stands as the first sustainable office in the skyscraper’s near 80-year history. Certified LEED Silver in the Commercial Interiors category, the project is on track to set a historic precedent. The design features exposed ceilings, beams, and large architectural columns, which contribute to an overall loft-like feel. 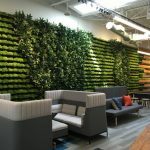 Private offices are located in a central interior core — a planning element that flies in the face of more traditional workspace layouts — and feature executive offices along outside walls. A large elevator bank divides the space into two distinct, disciplinary studio wings, with interior designers in the south wing and architects claiming the north. The elevator bank’s central location also allows different entrances for employee and clients, which minimizes congestion in the reception and client center areas. The exposed ceilings and columns are painted white and anchored by black distressed wood floors, providing a clean palette for the minimalist studio benching system that was inspired by Norman Foster’s studio in London. The benching system, which was designed with Arhend to merge European and American work trends, creates a place where staff and guests can see one another’s work in progress, become engaged in the design process, and collaborate freely. Philosophically, the benching system creates a studio based on the tasks staff members perform, rather than position or titles. This results in an egalitarian environment where everybody shares one work table. The expanse of open studio space is balanced by smaller, team-oriented spaces, including two cafes featuring undulating communal tables, as well as various group seating arrangements dispersed throughout the office. These design elements were included in response to the trend of break-out social spaces, and are intended to encourage creativity and boost morale. The office’s client center and reception areas were also planned to accentuate BBG-BBGM’s communal values while highlighting its design expertise. Geometric angles created by a marble reception desk and servery accentuate a modern feel, while softer sectional seating and a ring of bright yellow leather basket chairs balance these elements. The overall aesthetic is sleek and minimalist. In addition to a modern look and feel, BBG-BBGM wanted to highlight sustainable craftsmanship. An important impetus for this green design was the Empire State Building’s aging infrastructure, which gave the firm an opportunity to custom design new utilities from scratch in order to reduce consumption. The most notable of these are two, 9,500-lb. cooling towers that were installed on a building setback at the southwest corner of the 25th floor. These EnergyStar rated towers are tucked into a corner of the terrace, invisible to both employees and the public. The equipment allows the entire floor to be sub-metered, with all mechanical systems controlled by the BBG-BBGM. In essence, the firm is its own building manager. In addition to the mechanical systems, a multitude of sustainable design elements were incorporated into the actual workspace, including low-flow fixtures, motion sensors, and automatic sink faucets and hand driers in all lavatories. Eco-friendly materials were utilized to the greatest extent possible; low-emitting VOC paints, adhesives, coatings, sealants, plastic laminates, and non-formaldehyde MDF panels were all included in the finished design. Construction included the use of recycled materials such as wood floors, carpet, and fiberglass ceiling panels, as well as renewable substrates such as the strawboard in custom millwork. Moreover, design plans took full advantage of a continuous panel of 76 windows that run along the perimeter of the space, offering sweeping, panoramic views of Manhattan. The interior design scheme maximizes this abundance of natural light through the use of white tones, exposed ceilings, and reflective surfaces, while light controls and sensor-based window shades auto-adjust according to the time of day to conserve energy. The result is an office that boasts a 15 percent greater energy efficiency level relative to offices of similar size. Though BBG-BBGM is exceedingly proud of the finished product, this project was not without its challenges. A number of issues arose during space planning, component construction and studying the office’s mechanical systems. One of the greatest challenge is the most obvious; built in 1931, the Empire State Building simply does not provide as much infrastructure as other standard buildings in New York City. However, the lack of infrastructure actually ended up presenting the firm with a unique opportunity to express its commitment to sustainability and design utilities from scratch. 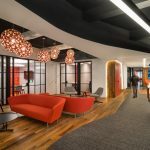 In addition, the project has helped reposition the Empire State Building as appealing choice for office real estate with significant design potential. What ultimately proved most difficult was designing for two practices (architecture and interior design) with one core business. Both cultures are quite different on the surface, but analysis revealed them to be two halves of the same whole. Each want their work to be the focus of the workspace — it should enhances talents rather than distract from them. This space does just that. Equisite work overall. However allow me to say the flooring choices are pedestrian reall, We’re here for you to create more memorable aesthetics to your otherwise exciting designs.